Well it’s official – I now have my new writing pad in Barcelona, and it’s going to be the opposite of the minimalist London abode that glares with light and trills with electronic devices. While I’m not quite going back to an Olivetti (heavy keys! mucky ink!) and a desk piled with papers, the place will be traditionally styled and free from the endless beeps that tell me what I should be doing in the next hour or so. Off to catch a flight right now, back at the weekend. The new place looks great. The wood and darkish red carpet are very nice and the samll balcony. However, if the place IS haunted, well, then the brick wall, the wood floor and the metal stairs in particular could prove bothersome. I mean, if there should be footfalls and body dragging at one or two in the morning. And that balcony seems high up. Consider having someone in to deaden the reverb. Very nice indeed. It looks like a recently completed insert into a much older building so probably has strange corners and definitely odd noises in the night. It may not have all connections but I’ll bet you have WiFi. Have a great time. 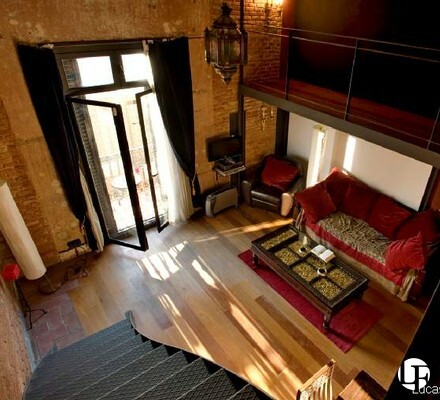 Like the look of your place in Barcelona – lovely city to live in. Hope you’ll be v. happy there. Odd coincidence that you are writing about it today when news of Robert Hughes broke. Brilliant man, cracking good writer. Congratulations and ENJOY. Please make sure that your output doesn’t dip too much. Have to agree with everyone else, the place looks great. If you have any problems with weird noises in the night, then I am sure that you know a couple of guys that can help you out if you can persuade them to take a working holiday out of London. Ghosts are easy enough to deal with – just tell them to get out. Be firm and take no backchat – you are master of your home. Is that an abandoned copy of katie Price bio I see on that table? Very nice gaff,hope it’s full of inspiration. Read the invisible code great story ,brillant still moments,but could I have some more threat please.MORE!I hear you say,Yes I love it when the some of the members of the PCU fates lie in the balance and you find yourself growing tense as you begin to read quicker and quicker as the situation progresses and gets ever more dangerous not knowing if the next page could be their last.Give me that fix ! If not stick a knob joke in.